Rustic Mount Baker Lodge is nestled in the spectacular North Cascades and is a beautiful, fun getaway three hours from Seattle. Located within walking distance of the Mt. Baker Ski Area and numerous summer and fall hiking trails, enjoy the mountains and valleys in the Mount Baker-Snoqualmie National Forest and surrounding wilderness. Friday night stays includes Saturday Breakfast. Saturday Night stays include Saturday dinner and Sunday breakfast. The Mt. Baker Committee encourages groups, such as Scouts, school/youth, or family & friends gatherings, to consider using the lodge whether or not they are members. Not only does the area offer many options for outdoor activities, but it is especially appropriate for experiential classes in outdoor related skills and activities such as avalanche awareness, winter travel, survival skills, MOFA courses, photography, etc. The lodge accommodates 62 persons + hosts. For group reservation, please complete our group booking request form. Non-scheduled openings may be arranged if hosts can be found but be aware that, since most of our volunteer hosts are working full-time, midweek reservations may be hard to staff. The sooner you ask, the more likely it is that someone can be found. During winter and early spring, all cars must carry chains and a snow shovel! A Sno-Park permit is NOT needed to ski at the Baker Recreation Company’s ski facility BUT if you choose to cross-country ski at the Salmon Ridge Sno-Park on the Nooksack River the Sno-Park pass is required. Take I-5 to Bellingham. Take Exit 255, the Mt. Baker Highway. Drive East on SR-542 approximately 54 miles to the ski area. At the junction in front of The Firs Chalet, turn right onto the one-way loop road. The parking lot for the Lodge is on the right side of the road about a third of a mile beyond The Firs Chalet. Driving time is approximately 1½ hours from Bellingham and 3 hours from Seattle if roads are free of snow and there are no traffic issues. The last gas station is on SR 542 in Maple Falls. Summer at Mt. Baker Lodge offers wonderful hiking on a great variety of trails. Numerous trails are within walking distance or a short drive from the Lodge. Many are suitable for children. Artist Point is just 3 miles away at the end of a paved road, with panoramic views of Mt. Baker, Mt. Shuksan, and the North Cascades. Snow play opportunities usually are abundant through the summer. Early fall provides all the above plus fine blueberry picking, so bring your containers. For more information you can visit the Mt Baker Chamber of Commerce Visitors Center on the way up in Maple Falls. It is open daily 10 am - 4 pm. The Chamber Center has a free printed list of trails, current trail conditions and other publications on the area. The Glacier Public Service Center is located just east of Glacier and is open daily 8 am - 4:30 pm. Posted outside the front entrance to the Service Center is a listing of trail conditions. They don't have a printed version but they do have a printed listing "POPULAR TRAILS-MT. BAKER HIGHWAY (STATE ROUTE 542)" that gives directions to the trail head and a brief trail description including distance and elevation gain. For additional information on trails and conditions in the area check out the Mt. Baker-Snoqualmie National Forest website. Also visit Mt. Baker-Snoqualmie National Forest - News & Events for a listing of lectures and events offered at the Heather Meadows Visitor Center. The WA Department of Transportation plows Mt. Baker highway as needed to keep the road open to the ski area. The crew is on duty from 4:00 am till 2:30. If there is snowfall after 2:30 they may or may not plow the road and you may be required to install chains on your car including cars that are all wheel drive. Check the condition of the Mt. Baker Highway (SR 542) before you start your trip so you know what to expect. You also might want to check the Baker ski area Snow Report and the area Weather and Avalanche forecasts at the links listed below. When coming to the lodge be prepared to install chains. When parking in the lot make sure you are parking outside the fog line and not on the highway. Vehicles parked on the highway or inside the fog line will be towed. When you are in the lodge check the parking lot map on the bulletin board to make sure you are parked correctly. Please check in at the Lodge on arrival, prior to going hiking or to the ski area. Use the short trail from the parking lot to the lodge. The trail is on your right as you face the back of the lot. Please note that because this is a state highway, cars left on the road, at any time, will be impounded and towed by the state. If you need help finding a spot to park, come to the Lodge and we will help get you into the lot. Q: Is dinner served Friday night? A: Dinner is not served Friday night, but the kitchen is available if you would like to heat up your food. Q: What time do you open on Friday, and close on Sunday? A: Generally, we try to open between 3pm-6pm on Fridays, and we close between 10am-11am on Sundays. However, it may vary: check with your weekend's host. A: Along with your skiing, snowboarding, snowshoeing, or hiking gear, bring lunch and snacks, a sleeping bag, pillow, flashlight or headlamp, towel and any other personal items. We do not have a washer and dryer so extra clothes are good. A: Yes kids are allowed! However, please note that the lodge is not childproof, (open stairwells, for example) and that it is dormitory style sleeping. Contact the lodge hosts for the weekend you are interested in for more information. The hosts contact information can be found when signing up for an overnight stay. Q: Can my group stay at the lodge? A: Yes, we would love to host your group at our lodge! See Group Reservations for more information. A: View the directions above. Q: What can I do while I am staying at the lodge? A: In the winter there is downhill skiing at Mt Baker Ski Area, snowshoeing, inner tubing, and backcountry skiing one of the many routes in the area. In the summer and fall there is a wide network of hiking trails to explore. You can also enjoy reading a good book or simply soaking in the beautiful views of Mt Shuksan and Picture Lake from the lodge. 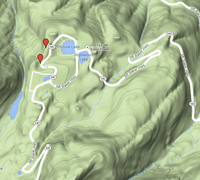 Q: Where can I find current ski reports and hiking trail conditions? A: Hiking trail conditions: For a list of hikes and trail conditions visit the Mt. Baker-Snoqualmie National Forest webpage. Current trail conditions are also posted outside the front door to the Glacier Public Forest Service Center. The center is open 8am – 4:30pm Thursday-Monday, May 1 to mid-June and seven days a week, mid-June through September. A: Ski conditions: Check the Mt Baker Ski resort site for up to date conditions and for Nordic skiing trails and conditions visit the Nooksack Nordic Ski Club website. Q: Is the Lodge heated? A: The Lodge is indeed heated but that does not compensate for the lack of insulation in the dorms. Be prepared to sleep with a hat on because it can get a little chilly upstairs! Q: Can I reserve a particular bunk? A: Sorry, but you choose your bunk when you arrive. All the bunks are on a first-come, first-served basis. Q: The Mountaineers is a volunteer organization. What can I do to help? A: We ask you to do at least one chore like cleaning, shoveling snow or meal preparation for each night you are at the lodge. We also have work parties every fall to prepare the lodge for the upcoming winter season. Q: I need to cancel my stay, but registration has already closed. Will I receive a refund? A: No. In general, refunds are not given once registration has closed. However, there are exceptions (see Flu Policy). Contact the weekend's host who will decide based on the Lodge guidelines. Would you like to help run a lodge for a weekend? Would you like to run a kitchen for a weekend? Find out what that would be like here (click on link)! Enjoy painting, electrical, plumbing, or carpentry work? If so, contact the Baker Lodge Committee co-chairs Amalija Kopac or Michael Wynne-Jones at MtBakerLodge@gmail.com. We'll show you how to enjoy the fun and beauty of Mt. Baker while helping to make a great lodge run smoothly. Contact our Member Services Team, info@mountaineers.org or 206-521-6001, if there is anything else we can do to help you.